I think this review best sums up my own thoughts about this book. First, I listened to the audio version as I do a lot of driving and it's easier to read with my ears than sitting down and going page by page. Second, I listened to most of this book in one sitting but I kept stopping the cd player so I could ponder what Ms. Robinson had just said and by the time I got through 5 disks I knew I'd have to start over because I was stopping the story so much that I was loosing the sense of the over all story. Third, the second time I went through the story I took it in 5 to 15 minute segments. I just finished it about earlier this evening; came home and played a couple of segments for my wife and then came on Amazon and bought 2 hard back copies: 1 for me and 1 for the 'Boudin" in my life. I'll be (sit-down) reading this book again in about 10 days. John Ames, a septuagenarian, small-town Iowa preacher has a failing heart. In an effort to compensate for the time they will never spend together, he writes an extended letter to his seven-year-old son. 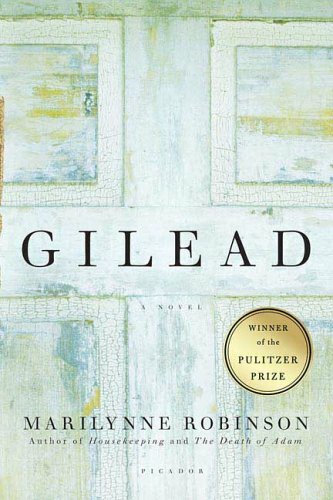 Gilead: A Novel, by Marilynne Robinson, is that letter. Though book-as-letter has been a precarious literary device since the inception of fiction, the brevity of Marilynne Robinson's novel makes it more palatable than it might at first seem. Ames has family history to tell - his grandfather collaborated with the abolitionist John Brown - and there is much personal history too, of which Ames struggles to make sense within the framework of his unshakable belief. I had my doubts about this one when I first started to read it, but soon my doubts were gone because this book is so sweet. It begins as a father recounting memorable events from his life, but then it evolves into some profound insights into human behavior. The book ends with the minister father, John Ames, and his name sake son understanding each other, after many years of not knowing each other. I marveled at the use of language in this book. It is told with an educated language, and it is so smooth: like a symphony. I am not usually one for slow paced novels. Especially ones about the trials and tribulations of a small town mid-western preacher. But Gilead is different. This is one of the best constructed and most beautifully written novels I have ever read. Characters come into focus through small details and moments that make up everyday life, and by the end, I was reading this like a page turning thriller; staying up late into the night to find out what happens to the characters. There's loads of reviews on this book so I won't duplicate explanations. However, I must say I fell into the category of those readers that just didn't care for this book. Yes, it has a quiet, gentle, reflective theme, but I admit to being just plain bored stiff. Sometimes after I've started a book that I just can't get into, I come to Amazon and read the reviews of others to see if I'm just totally off base. Then, I restart the book with a different attitude and try to envision what it was that others saw. For me, I never could capture the feelings of those readers who gave "Gilead" a 5 star rating. There were pages and pages that I read and reread time and again just trying to get something out of it. I didn't really become interested in this book at all until about page 220 when Jack Boughton reveals his reasons for returning home. As a preacher, John Ames, dies from a heart condition, the author, Marilynne Robinson, creates his fictional autobiography. Following are my thoughts regarding the form and substance of this novel. Additionally, I appreciate Robinson's symbolic use of Ames' relationship with the Boughtons. Ames' struggle with the young Boughton's presence in the life of the Ames family continuing after Ames dies represents the grappling most of us face at the end of our lives. Whatever concerns us as we die we realize that we have to let go because we will no longer have any control over those circumstances. We do not even have active influence. Ames' struggle with young Boughton also represents the necessity of dying Christians to reconcile difficult relationships. In this instance, reconciliation includes Ames' forgiving Boughton of actions of which Ames disapproves. Structurally, I find the book a bit of a difficult read. While I understand the lack of chapters and more definitive divisions given that the book is more of a journal of Ames' thoughts and recollections for his son - not having these divisions impairs my reading enjoyment. Gilead fondly reminds me of the books of Proverbs and Ecclesiastes. In Proverbs we find many instances when the author is advising his son and entreating him to heed his words of wisdom. In Ecclesiastes, the author at the end of his life, is pondering the meaning of life overall and his life in particular. It is important to pass on to our children our knowledge and understanding of both the history of ourselves and our family as well as our worldviews. This inheritance is especially important when we parents will not be able to do so personally, as is the case with Ames. This preacher provides for his young son more than just a chronicle of facts. This memoir gives the boy a perpetual insight into the thoughts and cares of his father. Later, these accounts will help him understand himself, answering questions that could have remained dubious for him without the autobiography. This kind of gift to our children (and other loved ones) could be one of the highest forms of spiritual leadership. Bitter and sweet and always brilliant! I was initially put off by the format, an aged father writing a series of journal entries for his young son to read when he is older after the father has passed away. But it is so beautifully done that I found myself immersed, involved with all the characters, and literally unable to put the book down until I had finished it. Part of the point of being in a book group is being exposed to books you never would have picked up on your own accord. In the best cases, you get wonderful surprises that leave you stunned and happy. In the case of my book group, this has meant some top notch stuff such as Jose Saramago's Blindness or Kazuo Ishiguro's Never Let Me Go, both of which I loved and would never have picked up on my own. Of course, the flip side is that you can spend precious hours of life reading something utterly awful -- and of the 75+ books I've read for my book group, this was undoubtedly the absolute worst. In it, we meet an old Midwestern preacher, who has decided to write a letter to his young son. And what a rambling, boring, pretentious letter it is. One reviewer pointed out that the letter-as-novel framework is the refuge of a writer bereft of any coherent notion of what to write. It removes troublesome considerations such as characterization, plot, pacing, structure, and resolution from the equation, allowing the writer to more or less free associate. To be sure, Robinson can pen a pretty sentence, but when it's not in the service of anything, who cares? What is our responsibility toward the prodigal son who never repents? John Ames is a 76-year-old Congregationalist minister with a failing heart. He has a seven-year-old son, the product of a late-in-life marriage to a much younger woman, whom he will not live to see grow up. Gilead is Reverend Ames letter to his son, a mixture of memoirs and advice. But as Reverend Ames writes, we become aware of unfinished business that he must deal with. And as we read his feelings and fears, we get a greater glimpse of the man that he is. Marilynne Robinson is a fine writer, and her talent shines through in this novel. I know an elderly Midwestern minister or two, and I think she has captured his voice perfectly in this book. This is a book about the importance of forgiveness, and the image of the prodigal son figures strongly in the story. But I believe the biblical story of the rich young ruler comes into play as well. Just as Jesus looked at the rich young ruler with love, despite of his failings, so should John Ames learn to love those who have disappointed him. Pointless, to me, is a strong word to use, and I spent a few seconds thinking about the title of my review before I finally decided to type that word. I think one reservation I have is simply calling a novel pointless which has received so much praise, both critically and otherwise. I certainly don't want to be disregarded as someone who doesn't "get" literary fiction, but finally I decided that that was a ridiculous reason and I have no reason not to state how I really feel. Having said that, I'll go on with the review. Just before I read Gilead, I read The Road by Cormac McCarthy. After reading these two novels, I seriously sat there and wondered just what it takes to win the Pulitzer Prize these days. While I found The Road extremely tedious and, quite frankly, boring, it at least had a narrative thread that was supposedly leading somewhere. Almost from the beginning of Gilead you can see that this novel has no real narrative thread, at least not in terms of a story or even much of a plot. It is written as a father's letter to his son, and that's exactly how it sounds. Just as anyone might write whatever they are thinking at any moment, so too does this narrator. There are literally passages in the "novel" which begin like this: "That suddenly made me think of something else I wanted to tell you..."
While I have a broad understanding of what it means to be a novel, and the different forms and subjects a novel can use, this particular book is a bit of a disgrace. I fully believe that if this were written in a fiction writing workshop, or if it were Robinson's first novel, that it would be criticized to death for its lack of structure or narrative. But as it is, because she released a (supposedly) good novel a long time ago, and there was such hype about this one, instead it wins the Pulitzer Prize. Gilead is well-written in a quiet, subtle way, and often good prose is enough for me to enjoy a novel, even if I find the story boring. But here it just did not suffice. I suppose if pressed hard enough I might even say that it's not *that* well-written, but it is certainly literary. Sorry, this may have won a pulizer prize, but I found it boring. The only reason I finished it beacause it was my book club book. When the characters were expanded it was interesting, but that was not often, most of the characters were flat and uninteresting. I found myself thinking was this the kind of history I would leave to my child - I think not. Sometimes you read a book at just the right time. Had you been at any other age or at any other point in your life - that same book would not have had the same kind of impact. "Gilead" by Marilynne Robinson was one of those kinds of books for me. I had just finished a book that was very good, very well written, but extremely hard to read. It was a reminder of the darkest sides to the human soul and left me with a feeling of despair. Picking up "Gilead", however, was like applying a healing salve to my soul. The incredible sense of grace and awe that permeates the book brought me back to a place of wonder. The simple joy that the main character, John Ames, takes in his wife and son - and in the physical world around him, made me remember that people are capable of good as well as evil. The book was reminiscent for me of Nicholson baker's "A Box of Matches". The main character distills an increasingly complex world down into simple pleasures. ""There's a shimmer on a child's hair, in the sunlight. There are rainbow colors in it, tiny, soft beams of just the same colors you can see in the dew sometimes...I suppose you're not prettier than most children. You're just a nice looking boy, a bit slight, well scrubbed and well mannered. All that is fine, but it's your existence I love you for, mainly. Existence seems to me now the most remarkable thing that could ever be imagined." For a spiritual man, Ames seems to find more wonder and meaning and holiness in the creations of the Lord than the existence of the Lord. He takes such warm delight in the unique humanness of those around him. "Since supper was three kinds of casserole with two kinds of fruit salad, with cake a pie for dessert, I gathered that my flock, who lambaste life's problems with food items of just this kind, had heard an alarm. There was even a bean salad, which to me looked distinctly Presbyterian, so anxiety had over spilled its demininational vessel." The words flow over the reader with warmth and love and gentle humor. The book enjoys a very easy, measured pace, and forces the reader to slow down and enjoy the stroll. The book is full of the true, flawed, glorious, doubting and genuine spirituality that I wish there was so much more of in the world, and has none of the preachy, holier-than-thou, viciously righteous religion that has done nothing but evil in our world since humans came into being. The book also reminds me that there is magic in the written word. At times Ames is talking to his 7-year old son, but can then switch mid-paragraph to talking to the same person in his adulthood. By committing his thoughts to paper - he realizes that he can transcend time and talk to the person his son is now and the person his son will be - and that his words will have different meaning depending on the stage of life of the reader. At times Ames also steps out of his role as a father and acknowledges his role as a writer. "In writing this, I notice the care it costs me not to use certain words more than I ought to. I am thinking about the word "just". I almost wish I could have written that the sun just shone and the tree just glistened, and the water just poured out of it and the girl just laughed - when it's used that way it does indicate a stress on the word that follows it, and also a particular pitch of the voice...there is something real signified by that word "just" that proper language won't acknowledge. Robinson has created a timeless thing of beauty in this book. It's a window to the soul of a man who while old in years, still possess the wonder of youth. His eyes and heart have seen much that is sad and hurtful, yet he still values every aspect of the world and the life he has experienced. He knows that he has not much longer on this earth, but day by day and minute by minute, he is thankful. "I hate to think what I would give for a thousand mornings like this. For two or three." Even if I never read "Gilead" in its entirety again - I cannot imagine I will not go back to it again - when times are dark and I need a bit of light and love and wonder. The novel Gilead by Marilynne Robinson is pretty great. The voice in Gilead is wonderfully convincing. The narrator is a minister in his 70's who's got a bad heart and is writing to his 7 year old son who will never probably be able to know his father really, know what his father was like. So the minister starts telling his life story which involves telling about his father who was also a minister and his grandfather who was also a minister, one who rode with the abolitionist John Brown. The book is a sort of history of religion in America across the last 150 years, talking about Karl Barth and Sartre, and talking about how God gave the American people visions back then to encourage us to break the chains that bound the Africans to the mud of slavery. And this novel also gives a beautiful evocation of life in Kansas and Iowa since the middle of the 19th century. Robinson, who's from small town Idaho I believe, really knows how to write down what it's like to live the kind of quiet life you get in places like Charleston, Illinois, a town I lived in for 25 years. The minister's son in the novel is 7 years old in 1956. So, for me, there are also lots of charming moments that remind me of my growing up. The boy's watching the Cisco Kid (one of my favorites) on a tiny TV set, going to movie theaters to see movies about US Marshalls in wide brimmed sombreros rounding up bad guys riding hard-tracking mustangs, etc. It does take me back. I like the history and the prairieness and the popular culture references a lot, but I'm not sure what I make of the novel finally. It is so Christian, so God taken and God drunk. I figure that maybe Robinson is arguing that Christianity should return itself to the sort of humility it had at some point in the past when it was beset by existentialism. But I'm not sure if Christianity ever had that sort of humility. I know that the Catholicism I knew in the 50's was never humble. It was pretty muscular. The Pope was a sort of ecclesiastical Uncle Sam rolling his sleeves back to punch the God-cursing Commie specter of Joe Stalin in the nose. Are there any humble religions? I know there are humble people inside (and outside) religions, but humble religions? Self effacing religions? Head bowing religions? I'm not sure. But I do recommend Robinson's book. It's thoughtful and beautifully written and makes you wonder about things worth wondering about. Like a Rembrandt or a Gauguin, or an exquisite gourmet dinner, you will savor the writing, the language, the nuances and the hidden humor in this masterpiece novel. Warning. You'll also weep as you journey with John Ames, the 76-year-old still-in-the-pulpit Congregational minister in Gilead, Iowa. It's 1956 and Pastor Ames is journaling a life letter to his seven-year old son, an extraordinary blessing from his second and younger wife. Warning #2. It will slow you down. Way down. Gilead will prick your emotions, then trigger snickers that balloon to belly laughs. Why read it? It's a masterpiece of writing, words and ideas. It will inspire your vision for excellence. It's not a leadership or management book, but it is. The long version of the bible. I continued reading thinking to myself there must be more to this book or perhaps the ending makes it all worth while. However, this was not the case at all after I labored through the entire book. It was incredibly boring unless you really like reading the bible and someone's interpretation of the meaning. There were parts that were nice, but it just went on and on and on. I think I could have made better use of my time by reading a textbook instead of choosing this novel for what I thought was my reading pleasure. One of the worst books I have ever read. Marilynne Robinson's first book, 'Housekeeping' is one of my favorite novels. It took her many years to write another novel but she has done it again. She's written a beautiful, poignant and haunting book. The story is about an Iowa minister who is 76 years old. He was widowed when young and remarried much later in life. He now is dying and will be leaving his 7 year old son and young wife behind. This novel is comprised of a book-length letter that the minister is writing to his son to be read posthumously. The book is part memoir, part philosophy, and partly a treatise on forgiveness and acceptance. The minister's best friend has named a son after him and this son has turned out to be the family black sheep. Not only is this young man the minister's namesake, but he is his Godson as well. The minister tries to understand him by writing about his life, the man's relationships and actions, and how the minister has learned to forgive things he did not initially understand. Marilynne Robinson impersonates John Ames III (JA3) a tired, mild 77-year old Congregationalist preacher in Gilead, Iowa. His father (JA2) and grandfather (JA1) were preachers, too. JA3's heart is failing, so he sets out in the Spring of 1957 to write a letter to his 7-year old son (referred to as Deacon, but is he JA4?). I don't think Robinson clearly thought through the narrative stance of this novel, since as early as page 17 Robinson must have the letter shade into a real-time diary to have something longer than an anecdote onto which to structure the novel. Since the diary is in real-time, only supernatural clairvoyance can explain JA3's decision to include John Ames Boughton (JAB) in the letter and eventually have his storyline dominate the novel; so much so that JAB's last monologue is quoted in its entirety. One explanation could be that Robinson had two separate stories that werent long enough for a novel and she stitched them together as best she could. Early in the novel the JAB theme is driven by JA3's paranoia that JAB will harm his wife and child, but that slim plot device passes when the author springs JAB's recent history on us and that drives the novel to its climax. Robinson's Oh-By-The-Way-JAB-Married-A-Black-Woman is abrupt and does not grow organically within the novel; it's just a device used to swing around JA3's opinion of JAB so there can be a blessing. You see, fathers never rebuke sons---even if they do what JAB has done (and his conduct toward his daughter is an abomination). Robinson's style aptly imitates the tired and mild old man, although I thought her style might have instead imitated the tedious books our narrator has read (to have a perfect understanding of this novel I would have to have read The Essence of Christianity). The style is compatible with his intellect as he is too tired to provide knockdown arguments, but like Job rests instead in simple acceptance of personal religious experience. I appreciate how Robinson leaves some things hidden like where his present wife, Lila, came from, why she came to Gilead and what is her relationship with JAB; or what was written in that letter from JA2 to JA3. Robinson is so gentle and subtle, the change of gender of a pronoun carries great meaning. What do you do when the world passes you by, when your reason for existence is gone? Founded by FreeSoilers in the fight against slavery, Gilead, Iowa had a purpose, but by 1957 the need for the town has long disappeared. The narrator's family realize this early and abandon the town---and him. Grandfather JA1 (fire),fighting to have free people on free soil, finally abandons the family in 1890 to die in Kansas where he fought the good fight. Brother Edward leaves for school in Germany and returns in 1896 an atheist and leaves Gilead for good. His father, JA2 (ash), destroyed by Edward's change, finally leaves Gilead for Texas and loses his faith. In 1905 JA3's new wife dies in childbirth, and the child dies soon after. So what does JA3 (water) do? Like Job, he stays faithful to God; he lives on alone for 40 years in Gilead writing sermons that answer his own questions and which his flock does not understand. JA3 stays in Gilead because it is a place where "a harmless life can live unmolested" where he can throw around a baseball and know in his heart that he'll be one of those "for whom the rejoicing in heaven will be comparatively restrained". Marilynne Robinson's Gilead is a novel about the relationships that develop between fathers and sons. The plot centers around a Methodist minister, John Ames, in the small Iowa town called Gilead. The book is written in the form of a journal which Ames is writing for his seven year old son. Ames is 77, and has a heart condition that is getting worse and will soon cause his death. He wants his son to know what type of person he was and is generally trying to pass on fatherly wisdom. The conflict arises when Jack Boughton, Ames' childhood friend's son, arrives in town and takes special interest in the Ames family. Boughton has a sordid history and has a talent for irking Ames. Much of the book then centers around the mystery of Jack Boughton, and what deed he committed that drove him out of Gilead. Through the course of the story the minister reveals much of the Ames family history and the youthful adventures of Jack Boughton. Robinson's prose is poetic and captivating. The book dictates your mood; after reading a few pages you find yourself moving at a slower pace, wistfully remembering your own childhood with literary distance. This isn't a fast-paced, exciting read. But it is classic literature that should be read. I really don't get why people seem to love this book so much. I got the themes -- the meditations on the relationships between fathers and sons, for example -- but overall this book didn't strike me as tightly written. It felt more like Robinson jotted down miscellaneous thoughts, realized she couldn't figure out a way to use them in a conventionally structured novel, and decided to use the epistlatory form as an easy out. Robinson can write -- there are paragraphs here and there throughout the book that are beautifully crafted -- but the book as a whole is disappointing. This book is written from the perspective of Reverend John Ames who is nearing the end of his life and has decided to write down his life's thoughts for his young son. He married and conceived a child late in life and is afraid that his son will never really know him. This narrative is an effort to leave something behind for his son to read and discover. He writes of his parents and family, how he met his wife, and the daily goings on as he writes the memoir. It almost goes without saying that Marilynne Robinson is a skilled writer. This novel is a sentimental letter from a man in his 70s to his young son from a much younger wife. His words are full of love and sorrow that he will never see his son grow up. I've often been known to be susceptible to semtimentality but the emotion in the novel did not resonate for me. I saw a number of reviews indicating this was slow paced and I was prepared to take my time with this book. As a lapsed Roman Catholic that went to church each Sunday in my youth, I have certainly heard enough sermons in my life. I found this book to be a long and boring sermon and the theological minutiae in it really didn't interest me. I found this to be hard work and I struggled to finish the book. I frequently drifted into other thoughts while reading it as the subject matter did not hold my attention. "I was struck by the way the light fell that afternoon. I have paid a good deal of attention to light, but no one could begin to do it justice. There was the feeling of a weight of light--pressing the damp out of the grass and pressing the smell of sour old sap out of the boards on the porch floor and burdening even the trees a little as a late snow would do. It was the kind of light that rests on your shoulders the way a cat lies on your lap. So familiar." I'm a little embarrassed to say that I gave up on this one. I know it won a Pulitzer, and the last Pulitzer Prize-winner I read was amazing, click here to see my review of Oscar Wao, but I just couldn't do it. I made it to page 76, but I kept falling asleep on the couch. So bad it's offensive. Why is this "fiction"? It's pages and pages of the main character (and I guess by extrension, the author) spouting his opinion on God and religion and fatherhood in a very boring way. I recommend "The Road", by Cormac McCarthy. Now there's an enjoyable read, and arguably about the same set of topics! There are so many things that this book is "about." Fathers and sons, the desire to be remembered when you have left this World for the next, family histories (and skeletons), redemption, love, the transformations of Faith. Marilynne Robinson expects her readers to rise to the occasion when they are reading GILEAD. There is no dumbing down of the text to make it accessible, and for this I am glad. Words as put together by Marilynne Robinson are meant to be savored rather than swallowed whole. I recently read an atrocious book which has as its premise a parent creating a memoir for their child, and that experience served as a counterpoint to what this story, which has a similar basis, can be when done well. It is done magnificently here. Reverend John Ames knows that he will not be able to watch his little boy grow up, and he wants to leave him a story, something telling the little one what his father was like, and what kind of heritage he has. Woven throughout this narrative is Ames' own struggle with being a good Christian while having some uncharitable thoughts about others. Ames is a delightfully approachable and human character; just because he's a Reverend doesn't mean that he doesn't have faults and foibles. Discovering this about him is what makes GILEAD a five-star read. Robinson writes about Faith as it would be if I practiced it as I wish to, and her lyrical prose, "nothing true about God was ever spoken from a position of defense," serves to help me structure my own thoughts about God in a manageable, peaceful way. Marilynne Robinson's GILEAD is written in the form of a letter from an aging Congregationalist minister, the Reverend John Ames, to his young son. The novel is set in 1956. Ames, his young wife Lila, and their seven-year old boy live in Gilead, Iowa. Gilead, a biblical place whose name means "hill of testimony," seems to be something of a misnomer for a place so flat as that part of Iowa, but in the context of this novel, "Gilead" takes on an additional significance as a life testimony, and for Ames himself, a memorial (a grave mound). Ames, who is ailing with a heart condition, writes in order that later his then grown son will know something about whence he comes. Ames, his father, and his grandfather were all ministers. Ames's grandfather was literally called to the ministry, believing that he had been graced with visions of Jesus, of which most striking of all was an appearance of Jesus in chains. His grandfather took that to mean that he should dedicate himself to the abolitionist movement, and he became involved in some violent radical actions along with the (historical) abolitionist John Brown. Ames's father was, by contrast, a pacifist, and the father and son had a difficult relationship. Ames feels distant from both his father and grandfather. He loves his own son dearly, and yet knows his life clock is running out on him. It's difficult to carry off an epistolary novel. In the days before email, the letter was a real art form, though, and the best writers could be spellbinding and highly entertaining. GILEAD's success rests principally on the strength of Robinson's masterful use of language. Early on in the novel it seems like the story, as such, really isn't going anywhere, but you want to continue on just because the language is so beautiful--spare, astringent. Eventually, though, this reader hungered for something a little more. Later on in the novel, fortunately, some tension develops when Ames's namesake, John Ames Boughton, the son of his best and oldest friend, comes to town. Boughton, a disgraced profligate, returns as the prodigal son, but Ames isn't quite ready to assume the role of welcoming substitute father. Ames is also worried about Boughton's friendly contacts with Ames's wife and child. I had the opportunity both to listen to the audio version, read by Tim Jerome, and read the book myself. Jerome has a marvelous voice, perfectly suited for the Reverend Ames, but after a while I frankly found it tedious to listen to the audio version. On the other hand, I very much enjoyed reading GILEAD, even if, admittedly, it tested my patience at times. Wonderful bedtime reading - puts me to sleep everytime. Gilead is a nearly perfect book. It is quiet, multi-layered, and deeply spiritual. Composed in the form of a letter from the elderly protagonist, John Ames, to his young son, the work is a meditative near-monologue about faith, anger, love, and forgiveness; emotional patrimony, isolation, and loneliness. Absent characters loom large, and vast haunted landscapes are communicated in just the barest of verbal exchanges. Another book you can't put down to you finish it. A man of the cloth who has a child later in life writes a letter to his young son. The father's death is soon and he reviews life by writing this letter. He tells his son about the love he has for his mother, friends and family he has lost and realizations about himself. Quotes: "The moon actually moves in a spiral, because while it orbits the earth it follows the earth's orbit around the sun." I bought this book simply because it won the Pulitzer and I wanted to read something a little deeper than my usual beach read fare. It took me some time to get into it, after about 50 pages I realized that I had to slow down and read it more carefully. I went back to the beginning and started to read it like a letter and then I got it. Ms. Robinson has a way with words, if you allow them to they can transport you to the time and place she's writing about. The book arrived in excellent condition and in a timely manner. Thanks so much. Such a moving and powerfully sustained reverie. For a long time, when reading it, I thought its narrative voice was of an African American. To me, one of its most intriguing lines is: "He told me once that being blessed meant being bloodied, and that is true etymologically speaking, in English--but not in Greek or Hebrew. So whatever understanding might be based on that derivation has no scriptural authority behind it." The entire book, from beginning to end, starts at the same pace along with being kept on the same note. It never intensifies, things never get tense, and it continues at a slow pace throughout. This made the read very dull. There was never a time where I got "hooked" because the book never developed anything. The thing that did save the book for me was that the main character was a well-rounded one. He had emotions that ranged from all over the spectrum and constantly showed the internal conflicts he had with his religion and philosophy. This made the main character extremely interesting along with the plot of never being able to see his child grow up because of his age. The other characters, are, well... not there. He talks about them but there isn't any substance in his relationship with them. I expected to see the main character to be further fleshed out by defining the relationships he has. Reading the summary about the abolitionists and pacifism aspects of his father and grandfather made it seem like there was going to be a dynamic relationship between the 3 generations. Instead, it is more of a regurgitation with not enough interaction to really speculate or apply anything. Gilead by Marilynne Robinson is a novel for reflection. It is not just one of those books that can be read on a whim but must be read in a quiet place, where there are no distractions. I give Gilead, though it was a good book a 4 because it took a little while to get into it. Once I was in the story I was hooked and actually finished the book within three hours. Recently I have been reading my "teen" novels just for something to read and I have come to the realization that I have outgrown them. They bore me, their problems and ideas are trivial unlike Gilead's, which are real, lifelike and not superficial. The story is told through a series of letters by narrator Reverend John Ames to his son. He recants about visiting the gravesite of his grandfather and how much he learned about his father while doing so. They are a soft family, kind, resourceful, and always positive. Though Reverend Ames is dying of a failing heart and has lived a hard life he continues to persevere and write in order to guide his son through life. Reverend Ames's first born, a daughter, died when she was a baby and now John Ames who is 76 will die before his sees his 6 year old son grow older. Gilead, to me is a story about finding yourself through the words of John Ames. It helps a person reflect on their own life and pushes the reader to think about his or her decisions in life. Gilead is inspirational and should be loved until the end of time because Reverend John Ames could be the person living next door. You never know. Wanted to love it. Didn't. I am an avid reader, I write (and have published) fiction, and I teach writing and literature for a living. I say all of that not to brag (really!) but to emphasize that I love literature and I try not to make snap judgments about the books I read. All of that said, I found "Gilead" to be one of the biggest disappointments of my reading life. I loved "Housekeeping" and I am not someone who gets impatient with slow, seemingly plotless stories, yet I didn't enjoy reading "Gilead" at all. I can still hardly believe I'm saying this, but there it is: I just didn't get anything out of "Gilead." In "Housekeeping," Robinson shows us someone who is a genuine nonconformist and free spirit -- not in a flamboyant, in-your-face way, but truly, deeply, and admirably. She also shows us the price a person ends up paying, sadly, for being a free spirit. I found this moving and brilliant in large part because she doesn't make any simplistic conclusions. The opposite seemed to be true of "Gilead." To be blunt, the sense of "wonder" that permeates John Ames' narrative ends up seeming like nothing more than an eloquent version of Forrest Gump's bland, overly simplistic platitudes. It's no wonder so many people loved the "message" of this book: who wouldn't love being told that we should take time to appreciate the wonderfulness of the world? It's something almost everyone already believes, so when a book reinforces this idea, we don't have to worry about feeling self-indulgent for believing it. Yes, I know that's a gross oversimplification itself, but still, I found this book almost entirely on the same note from the first page to the last, and rather than feeling "wonder," I felt profound disappointment. The critics hailed Marilynne Robinson's second novel, Gilead, when it was released in 2004. However, everyone I talked with about the book confessed that it was a total snoozefest. The novel came up in conversation with a new friend recently who was sure I would enjoy this character-driven novel. I had a little trouble getting into the story as it is a letter from the 76/77-year-old John Ames to his six/seven-year-old son. I think the problem results because the letter does not begin with "Dear..." The son's name is never given, which I found irritating. Why keep it a secret? The novel starts by stating "you" and that always makes me squirm. I felt as if Reverend Ames was addressing me, and I hate that in a novel. The letter that John writes flows smoothly, relating stories about his grandfather and father, and the child's much younger mother. The stories are peppered with family history and John's best friend and colleague Don Boughton. Like Ames, Old Boughton is nearing the end of his life but seems to be in much worse shape. Boughton's son Jack, has returned to Gilead. To Ames, he is a godson and a potential threat to become his wife's new lover after Ames dies. Jack, however, has other problems he is trying to resolve, the nature of which is quite surprising. It may seem that the letter rambles a bit, but it is carefully constructed. Gilead is reminiscent of William Faulkner's Absalom! Abaslom! in that the same story may be told repeatedly, but with each telling, a new information is gleaned. I got a bogged down on Ames' interpretation of the Fifth Commandment. Ames descends from a long line of preachers so his comments and thoughts are not unexpected. One thing I did find surprising and am hopeful that Robinson will give us in the future is the text to the thousands of sermons Ames has written and are now stored in the attic. I find myself wishing I could take a peek in the boxes. Gilead isn't for everyone, but I enjoyed the read. To appreciate this work is to have an appreciation of the subtle threads of the soul. There is no other way to take in this strange but hauntingly lyrical novel. For it is not a narrative in the usual sense. In fact, it's its ordinariness that is so exquisitely rendered that raises this book to such heights--but I must admit--it took patience for me to believe in this writer enough (and to get through the weaker passages) to see that this would be a not only be a worthy read, but a remarkable one. Rev. Ames simply is who he is. As plain as the clapboard houses that dot the Iowa lansdcape. The sections that struck me, though, were the scenes with the shadier characters that make up this story: their dialogue-so real; the depiction of who they are as people--absolutely fascinating. I really felt I was inside of these people or right there on the porch listening to them talk as I was an inner witness to the musings of our protagonist. It's this unusual skill on the part of the author that makes this novel so noteworthy.